The NHL season came to an end for the Toronto Maple Leafs on Saturday April 9th. They dropped a 5-1 decision at the hands of the New Jersey Devils. The loss was actually extremely beneficial for the club, as they officially secured last place in the NHL by failing to score any points. The Blue and White go into this summer with some large decisions looming. The first, and arguably the biggest, was what to do with Nazem Kadri and Morgan Rielly, two players that are seen by many as the future of this team. In a surprising move, both players were signed to six-year deals at very reasonable cap hits. You can check out a breakdown of those deals in this piece here. With Kadri and Rielly locked up long-term, the attention of the Maple Leafs must shift to the draft lottery, which will take place April 30th. There will be three separate lotteries that will determine which teams get the top trio of picks. The Maple Leafs have the greatest chance of selecting first and can drop to no lower than fourth overall. #Leafs season ends with a record of 29-42-11, 30th overall. Next up: Draft lottery on April 30th. Getting the top pick would mean the rights to draft Auston Matthews, the big pivot who played this past year in Switzerland. Two and three would mean a shot at either of the powerhouse Finns, Patrick Laine or Jesse Puljujarvi. Make no mistake, the goal is first overall, but if they do indeed slip to fourth, there are significant options. Pierre-Luc Dubois and Alexander Nylander are a couple of dynamic forwards who have had excellent seasons for their respective teams. If the Leafs decide to go the defensive route, Olli Juolevi or Jakob Chychrun would be great players to consider. Either could help shore up the blueline and would be a great prospect to have in the system. As I mentioned before, the Maple Leafs locked up Kadri and Rielly to six-year deals. These were their two highest priority players and both have now been dealt with. Lou Lamoriello will now have to deal with defensemen Martin Marincin and Frankie Corrado, as well as, forward, Peter Holland. Holland put up 27 points in 65 games this year. He can be a useful centre, maybe better suited for a role in the bottom six forwards. He’s also useful on the penalty kill, which should add to his value. It’s not clear where exactly he fits with the Leafs going forward and could see a trade occur this summer because of that. Next interesting RFA to sign for Leafs will be D Martin Marincin. From $700K to ??? for a player who was a significant surprise. Marincin is a different story. Acquired in a trade with the Edmonton Oilers, many didn’t know who Marincin was. At the beginning of his tenure in Toronto, he was seen as a solid defensive player. He wasn’t flashy and wouldn’t contribute to the offense, but he wouldn’t hurt the team defensively either. It was sometimes difficult to pick up where he was on the ice. This is not an insult by any stretch, rather it’s a compliment. He didn’t stand out for any giveaways or scoring chances against. Looking at the numbers shows that he is the Leafs’ most effective possession defenseman. He was also on the ice for the fewest scoring chances per 60 minutes of any Leafs’ defender. Corrado also played well once he finally found his way into the line-up. He put up a goal and six points in 39 games with the Buds this season. He’s decently mobile and should only get better as he matures under Mike Babcock’s system. Lamoriello will most likely re-sign both defensemen to be pieces for the future. Rumours have been swirling for months about the fate of the Tampa Bay captain. Will he leave the Lightning and come home to play for Toronto? Anything is possible and with Brendan Shanahan and Lou running the show, there seems to be a decent chance of making something happen. There are obviously arguments for both sides. 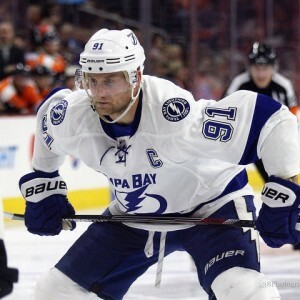 Stamkos is currently a member of the Lightning, a team that was in the Cup final last year and that is currently back in the playoffs this year. They are a strong team that is deep in all positions. Why would he come to Toronto, a team which is in rebuilding mode? On the flip side, Stamkos is born and raised in Ontario. He grew up cheering for the Maple Leafs and would be able to throw on the sweater of his boyhood team. Lamoriello and Shanahan have made some excellent moves, thus far. They will definitely be kicking tires on bringing him home. They could potentially offer captaincy, as well as a nice salary in the range of $8-9 million dollars a year. I’m not going to pass judgement on what might happen. It’s going to be a crazy summer for the Maple Leafs. The rebuild is completely on and the next pieces will be falling into place shortly. It’s an exciting time as the franchise is finally trending in the right direction.